Article and Artwork by Mia Martins, US West & Central Blogger jaBlog! This spring, one of LTC’s Junior Authors Writing Conferences is taking place at the Manor House Hotel, located in Guildford, Surrey, UK. Guildford has experienced extreme flooding this winter, ordering some residents to evacuate. Though a natural disaster may not sound like a reason to pack your bags and rush off to Guildford, I hope to persuade you that it actually is. Here are some reasons why going to Guildford would be a valuable experience. Man vs. Nature. There are three basic types of conflict within any story. The first is man vs. man, one person against another. The second is man vs. self, one person struggling against themselves mentally. The last is man vs. nature, one person against the forces of nature. If you are struggling with lack of conflict in your story, why not pit your protagonist against a force of nature? Because it is impossible to argue or reason with a hurricane, it makes for interesting conflict when an antagonist cannot be reasoned with. Write What You Know. I’m sure that you’ve all heard this saying before. But once you’ve decided to have a man vs. nature conflict in your story, how are you supposed to describe that giant tsunami/hurricane/tornado when you’ve never even experienced bad weather? Take me as an example. I live in the sunny, temperate part of California. If it so much as dips below 50 degrees in the winter, we start comparing our climate to that of the Arctic. While Guildford has been experiencing extreme flooding, California has been experiencing a declared state-wide emergency drought. I’m not sure I could accurately write about an overabundance of water, which is a foreign concept to me. In order to solve a dilemma similar to mine, you need to do the following. Have New Experiences. Sometimes, the best writing skill is simply having experiences under your belt. Though it may be tempting to stay inside your room all day and create imaginary worlds, even your favourite fantasy worlds work because they are partially grounded in reality. 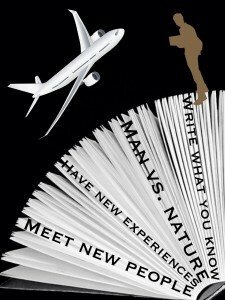 Get out of your chair and experience the world before you write about it! Traipse off to Guildford and experience an overly wet climate, cars on the wrong side of the road—yes, the wrong side—and different accents. I’m sure that no one can describe a flood as accurately as someone who has actually experienced flooding themselves. When you go to the conference, make sure to talk to others about their experiences. Meet New People. At the Junior Authors Writers Conference in Guildford, you will be surrounded by authors just like you. Some will be accomplished, published authors doling out advice. Others will be young aspiring authors, soaking up all the literary knowledge they can. The amazing thing about a conference like this is that authors of all kinds converge at one central location. This is a great chance to talk to many others about the odd, wacky, or wild things they’ve experienced that you haven’t. Be sure to respect everyone’s different backgrounds and beliefs while you trade differences in experiences. The End Product. You’ve finally experienced a flood. Now what? Go home and write about it, of course! Sit down and transfer your experiences into a story. Be clear and descriptive so that your readers can feel as if they are experiencing exactly what you’re describing. Share your experiences through your writing. Trust me. Your finished product will be worth every face full of water you endured when you can now describe a rainstorm impeccably. I encourage everyone to buy a ticket to the Junior Authors Writers Conference in Guildford. Not only will you experience the welcoming atmosphere of a conference full of writers just like you, but it is a chance to experience a new city or even a new country, along with a different environment. By supplying you with a variety of new experiences and ideas, coming to the conference will positively impact both you and your writing.